Rock Mario is a form Mario and Luigi can turn into when a Rock Mushroom is touched. Rock Mario makes its debut in Super Mario Galaxy 2, first appearing in the Boulder Bowl Galaxy. When Mario assumes this form, his cap, overalls, buttons and shoes take on a craggy appearance (excluding his shirt), with his cap and overalls gray in color. By shaking the Wii Remote, Mario will transform into a giant boulder. In this form, Mario can roll around and jump, damaging enemies and big red crystals with items inside them. If Mario touches certain enemies or a wall, he will revert to his rock form, but can be turned back into a giant boulder if the player shakes the Wii Remote. Although Rock Mario can destroy Boulders, touching Chomps makes him lose his health and powerup. It is possible to turn back to normal by jumping and pressing . This can stop Mario from flying off an edge, but this move is disabled during the second mission of Melty Monster Galaxy. The form later makes a small appearance in the Freezy Flake Galaxy where it was used to collect Launch Star pieces. The Melty Monster Galaxy, however, made extensive use of the power up in two of its missions. In the mission "The Chimp's Bowling Challenge", Mario had to use the Rock Mushroom to defeat Pinheads and score a total of 5000 or more points. In the galaxy's second mission, "A Stroll Down Rolling Lane", Rock Mario was needed to get across a large track to the Power Star. 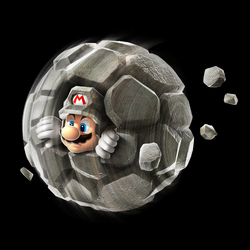 In his "boulder" form, Rock Mario is almost unstoppable and has limited control over his movement in rolling. When the player manages to stop his rolling and does not move the control stick for a short time (while he is still a boulder), he will automatically revert to normal. Moving the control stick right after the boulder has stopped will make the boulder roll again. In the second phase of the final fight with Bowser in Super Mario Galaxy, Bowser transforms himself into a boulder to attempt to roll and hit Mario, similar to Rock Mario's ability. Rock Mario joining the party. Rock Mario appears in Puzzle & Dragons: Super Mario Bros. Edition as a Leader, available with the game's digital update to version 2.0, unlocked after earning an A rank or higher in Course 1 of the Fixed Challenge in Score Attack. 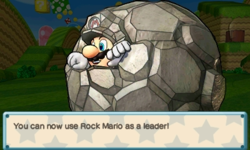 Rock Mario is a Wood/Light attribute member with an HP rating of 3/6, an ATK rating of 5/6 and RCV rating of 3/6. Rock Mario's Skill, Rock Guard, reduces damage the player takes for five turns, while his Leader Skill, Rock Hard, reduces the player's damage by 80% as long as their team's total HP is at 100%. Rock Mario uses Fruit and Rare Fruit to raise his Skill Levels. Rock Luigi appears as a Leader as well, unlocked after earning an A rank or higher in Course 1 of the Free Challenges in Score Attack mode. Rock Luigi is a Wood/Dark attribute member with an HP rating of 4/6, an ATK rating of 3/6 and RCV rating of 4/6. Rock Luigi's Skill, Rock Tackle, reduces HP of all foes, while his Leader Skill is Rock Hard, the same as that of Rock Mario's. Rock Luigi uses Spiky Shells and Grand Spiky Shells to raise his Skill Levels. Rock Mario makes a cameo appearance in Super Smash Bros. for Wii U as a trophy. As with many other trophies in the game, the Rock Mario trophy can be obtained when it appears at random in one of the game's modes, such as Vs., Trophy Shop, and others. Rock Mario appears as an Advanced-class support spirit in Super Smash Bros. Ultimate. When equipped, it increases the fighter's physical attacks. The fight for the spirit involves fighting a Metal Jigglypuff on the Battlefield version of the Mario Galaxy stage, and the opponent favors using the Rollout attack, which has increased power. Wii Super Mario Galaxy 2 (05/2010) If you're a fan of rock and roll, try picking up a Rock Mushroom. When Mario's transformed into Rock Mario, a simple shake of the Wii Remote can turn into a big, rolling boulder, allowing him to plow through crystals and tough foes. The most amazing thing about Rock Mario, though, is that he can still jump. ↑ Official Super Mario Galaxy 2 website. Nintendo HK. Retrieved May 18, 2018. This page was last edited on March 30, 2019, at 12:30.